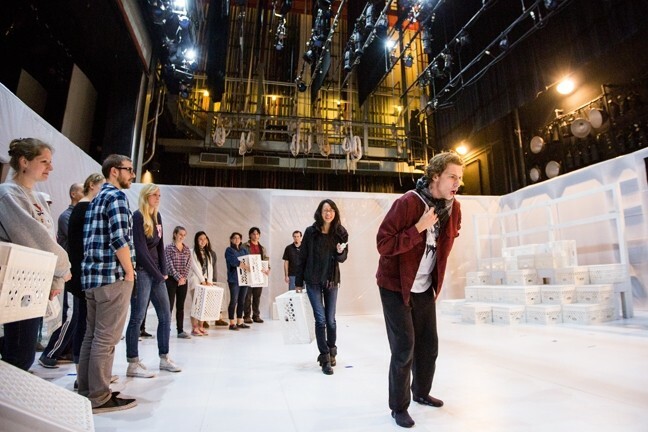 This is how The Other Shore, the latest production from Cal Poly’s Theatre and Dance Department, begins. Just moments before, the audience had gathered in the lobby of the Spanos Theatre. We were given white crates and told to follow the guide toward an enclosed setup on stage, lined with stark, white plastic sheeting and filled with more crates; these would be our seats for a show that brazenly defies conventional boundaries between spectator and spectacle. FOLLOW THE LEADER: In 'The Other Shore,' the audiences becomes a part of the play. Before the play begins, they’re led to the stage and can pick portable seating (white crates) that move throughout the show. Written by the Nobel Prize-winning author Gao Xingjian, The Other Shore has a history of pushing the envelope. Upon its debut in the late ’80s, the play was banned by the Chinese government for its subversive and experimental commentary on the relationship between society and the individual. There is no strict or linear story to the play. Instead, Xingjian creates a loose framework for various human interactions. One actor leads audience members around with a rope, then more actors join him. They decide to travel to “the other shore”—an ambiguous space where they face new knowledge, violence, greed, shame, and the entire gamut of psychological and physical reality. Essentially, The Other Shore works through a series of themed vignettes. After crossing “the shore,” the actors collapse and awake only to realize they know nothing. One steps above the rest, teaching them the words for body parts (“foot,” “hand,” “eyes”). They speak slowly, racked by a kind of absurd confusion. One points to their hand and with confidence shouts, “band!” As the play’s opening line commands, the scene takes on the atmosphere of a crazed game. It’s chaos that soon evolves into hysteria. For Machamer, the play’s non-linear structure and broad, opaque themes offered both a creative challenge and ripe opportunity. PICK A CARD: Toward the middle of the play, a sinister man challenges the group to a card game with both dire and absurd consequences. Unlike the typical theatrical experience, The Other Shore rips the fourth wall down before the show even begins. From the moment you step into the sparse, almost claustrophobic set, you become a part of the play. The actors react and act according to who the audience is, where they sit, how game they are. If you choose portable seating, you will move throughout the play—from the front to the middle to the back. You are in it in a visceral way just as the actors are. In some instances, this immersion can prove bewildering, stressful, and deeply moving. The mood is ever changing, and to both Machamer’s and the actors’ credit, there is never any sense of inconsistency or formless nonsense. The absurdity of the play, which contains a high-stakes card game, a peddler of “dogskin plasters,” and a quasi-Buddhist speech, builds with increasing furor over the roughly hour-and-a-half running time. With no elaborate special effects, ornate costumes, or other embellishments to distract, the audience is forced to focus and reflect. Why was that character so mean? Why did they reject him? Where is this going? Who is that? How? What? Why? During one of the last scenes, once some of the audience has moved to the center of the stage, the actors begin to circle them at a frenzied pace. They are looking for something—money, food, a subscription to People magazine, a leader, a human connection. 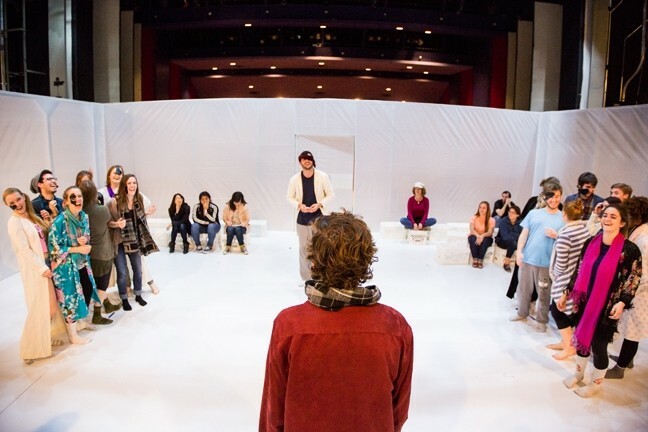 LET'S PLAY A GAME: You can see 'The Other Shore' at Cal Poly’s Spanos Theatre Feb. 26 through March 7 at 8 p.m. Tickets are $12 for students and $20 general admission. There is limited seating. For tickets and more info, visit pacslo.org or 756-4849. Jessica Peña recommends dogskin plaster. It really does cure everything. You can buy some from her at jpena@newtimesslo.com.